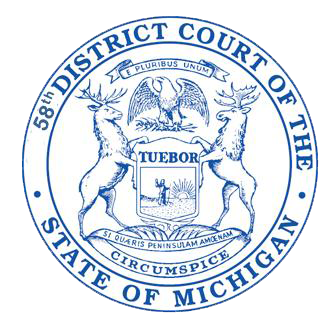 All criminal cases begin in the District Court; however, violations that are classified as felony cases are transferred to the Circuit Court after the District Court conducts a preliminary examination. A defendant can waive a preliminary examination and proceed with the case in Circuit Court. Cases that are classified as misdemeanor violation remain in the District Court. A District Court Judge or Magistrate sets the bond amount on all criminal cases. Some minor offenses have a standard bond set by the judges allowing arrestees to post a bond almost immediately without the necessity of going to jail. Offenses that are a more serious nature require the defendant to remain in jail after their arrest until a judge or magistrate sets the bond. The amount of the bond is determined by the degree of risk a defendant poses to his/her victim or society and the likelihood of the defendant appearing for future court appearances. Defendants posing high risk in these areas may have a higher bond set. In many cases, a District Court Probation Officer will conduct an investigation, called bond screening, into the defendant’s history of prior criminal acts, violent nature, employment, family connections, and substance abuse issues. The findings of this investigation are reported to the judge or magistrate prior to setting the bond to help determine the defendant’s inclination to commit further violent acts or evade further court proceedings. The defendant’s first appearance in court is called an arraignment. The defendant may be in jail and brought to the arraignment proceeding by the sheriff or the defendant may have posted bond and appears for arraignment on a set date. If the defendant is in jail at the time of the arraignment the defendant’s bond will be set and the defendant will be advised of their rights, asked if they need an attorney and asked if they wish to plead guilty or not guilty to the charge. If the defendant is not in jail at the time of arraignment then it is likely that a bond has been set. The procedure is the same, other than the bond, for the defendant that is not in jail as it is for the defendant that is in jail. If the defendant pleads not guilty at arraignment the matter will be scheduled for a pre-trial conference. The pre-trial conference is set so that the prosecutor or city attorney can review the charge with the defendant and/or the defendant’s attorney. In many cases, the pre-trial is the point in time when the defendant will agree to plead to a charge that is less serious than original charge. This practice is commonly referred to as plea-bargaining. If the prosecutor and the defendant do not agree to a lesser charge the case is then scheduled for a trial. A series of arguments, scheduled before the judge, may be scheduled prior to the trial. These arguments usually concern issues over what evidence is going to be presented at the trial. These arguments are called motions. The trial can be held before the judge alone or in front of a jury. A trial where the judge decides guilt or innocence of the defendant is called a bench trial. If the trial is held before a jury, the facts are evaluated and presented to the jury panel to determine whether or not the defendant is guilty or innocent. If the defendant is found not guilty at trial then the case is over for the defendant. If the defendant pleads guilty prior to trial or is found guilty at the trial then the defendant is sentenced. In accordance with MCR 1.110, all fines, costs and other financial obligations imposed by the court must be paid at the time of assessment. A sentence may include all or part of the following: payment of fines, costs, jail time or probation. If the defendant caused a monetary loss to a victim then the defendant is sentenced to provide restitution to the victim for the victim's loss. A sentence of probation is an alternative to placing the defendant in jail. Usually, a defendant on probation must report to a probation officer on a regular schedule. The defendant is given terms of his probation that include not committing further crimes, not using alcohol or drugs and the attendance at a treatment program. If a term of the probation is violated the defendant may be placed in jail. A civil case involves a controversy between two or more people where the plaintiff(s) in the case allege that the defendant(s) caused the plaintiff(s) some form of monetary loss. This loss can come from an injury caused to the plaintiff or to the plaintiff’s property. This type of case is referred to as a tort. Another type of civil case is one where the plaintiff’s loss comes from an agreement that was breached by the defendant causing the plaintiff a monetary loss. Small Claims cases fall under the same categories as discussed above except a small claims case cannot have an amount in controversy greater than $6,000. In addition, the parties in a small claims case are not allowed to have attorneys represent them. Cases that are greater than the small claims limit but less than $25,000 will be heard in the District Court as a civil case. An attorney can represent the parties involved in a civil case. Civil cases can end up with a trial on the facts and issues in case or, a civil case may end up with a default judgment because the defendant fails to answer the allegations made by the plaintiff. Civil cases may also have a pre-trial conference where the judge urges the parties to work out a settlement. There may be several motions heard in court before the case goes to trial. Depending on the form of action; a case may be tried by a judge or by a jury. A demand for jury trial must be filed within a certain time period along with a fee to the court. There are several procedures that take place when a jury trial is chosen. A selection process will take place to choose a jury and inform them of their roles in the case. In a civil trial, both parties have the chance to explain their side of the case beginning with the plaintiff and followed by the defendant. The trial allows all parties involved an opportunity to prove their case by providing evidence or witnesses. After both sides have been heard, the judge or jury will determine the verdict. The jurors would leave the courtroom until they have reached a verdict. A judge may also retreat to his/her chambers to consider the evidence before making a decision. Once a judgment is made, a verdict is entered and must be signed by the judge. Post-judgment procedures allow either party the opportunity to enforce or appeal their judgment. The process of attempting to collect on the judgment may continue for 10 years or longer after the court issues the judgment. The district court is also charged with hearing cases involving landlords, tenants and land contract holders. The process of evicting renters that breach a lease, usually by not paying rent, is called a summary proceeding. The landlord presents evidence to the court why the tenant should be evicted and the tenant may present evidence to the court why they should not be evicted. This procedure is generally the same for a property owner wishing to evict someone that has purchased his property on a land contract and the purchaser has violated the terms of the land contract agreement. These cases often involve a claim for money damages as well as a claim to evict the tenant or purchaser. If money damages are granted then the court may be involved in garnishments and orders to recover personal property to satisfy the money judgment. There are thousands of traffic tickets written in Ottawa County every year. These tickets all fall under the responsibility of the District Court. A traffic ticket, called a civil infraction, is issued when a driver violates a provision in the Michigan Vehicle Code or a provision in a local ordinance that substantially corresponds to the Michigan Vehicle Code. An ordinance violation is issued to a person that violates a local ordinance. A local ordinance can be anything from excessive noise coming from a car radio to a violation of a local zoning ordinance. A person receiving a civil infraction for the violation of the vehicle code or for the violation of a local ordinance can contest the charge in district court. The defendant contesting a violation or civil infraction will appear before a magistrate in an informal hearing or the defendant may request a formal hearing before the district judge. The informal hearing is exactly what it says - an opportunity for the defendant and the enforcement officer to informally present their case to the magistrate. Not all violations of the vehicle code are considered civil infractions. Many offenses listed in the vehicle code are criminal offenses, for example, drunk driving, driving on a suspended license, reckless driving and leaving the scene of an accident. Please contact the court if you have additional questions about the District Court and/or procedures in District Court.